« From Low $200’s > New Coquitlam CHARLAND Condos Near Evergreen SkyTrain Line > Only 88 Boutique Coquitlam Apartments Available Now! 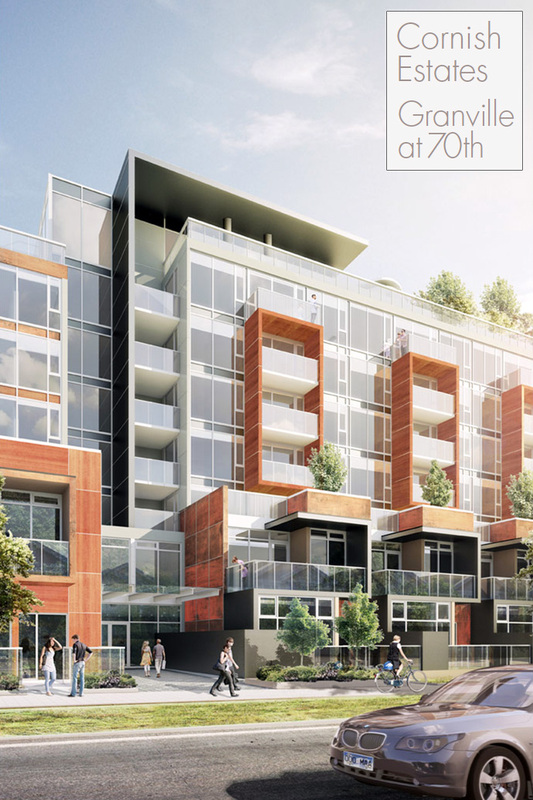 Vancouver Granville at 70th Cornish Estates and Penthouses Available Now! 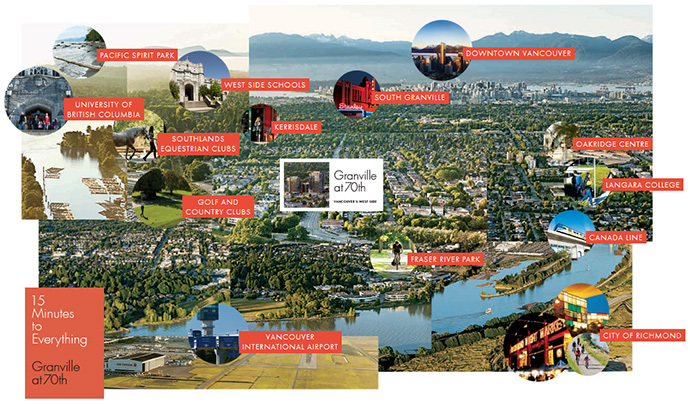 Phase 3 at Granville at 70th Vancouver Westside condo and townhouses is now launched! This is your FINAL opportunity to be part of the ever evolving Marpole Vancouver neighbourhood and its first brand new high rise community! From UBC to downtown Vancouver and from YVR to Steveston, the new Cornish Estates at Granville at 70th Vancouver plus the spectacular high-rise penthouses will give you living green walls, rooftop groves and gardens as well as an outdoor yoga pavilion. The spectacular development will also see the design and construction of an entertainment lounge (indoor/outdoor), a putting green, library, movie theatre and an onsite gym with spa facilities (like steam room and sauna). The Vancouver Granville at 70th Cornish Estates and penthouses is the final release (Phase 3) for this project before it is sold out. There will also be a brand new Safeway that will anchor the ground level boutique retail space on the property. The remaining homes including the Cornish Estates and Penthouses at Vancouver Granville at 70th Condos and Townhouses are priced affordably from just $460,900. According to the location map, the Granville at 70th Cornish Estates Vancouver West Side residences are within 15 minutes to everything including the City of Richmond, YVR, Canada Skytrain Line, Langara College, Oakridge Centre, Fraser River Park, Downtown Vancouver, South Granville arts and entertainment district, Kerrisdale boutique shops and restaurants, Golf and Country Clubs, top ranked West Side Vancouver public and private schools, the Southlands Equestrian Clubs, UBC and Pacific Spirit Park. Live close to everything that this beautiful city has to offer both indoors and outdoors! Register today for more information! The Cornish Estates are extra spectacular because of their high-end finishes and features that include kitchens with premium appliances (see below), fresh modern designed cabinetry with white matte finishing and granite counters/backsplashes. In addition, they will have a Kohler Vault kitchen sink (double bowl and stainless steel finish) in addition to polished chrome faucet by Kohler with a pull out spray for convenience. The Cornish Estates at Granville at 70th in Vancouver West Side also features rich walnut back walls in the kitchen. All homes will come with an LG 24” washer and dryer in addition to garburator in the kitchen sink. The bathrooms at the Granville at 70th Cornish Estates in Vancouver will feature fresh modern designed rich walnut cabinetry, white marble floor tiling, marble walls and counter tops. The sleek bathroom fixtures are by Kohler (chrome finish) and there is an under counter basin in fresh white by Kohler and white cast iron soaker tub in the master bathroom. The showers are fully enclosed by glass and there are Kohler high-efficiency toilets in white throughout the residences. The interiors of the Cornish Estates Vancouver Granville at 70th condos will also include rich walnut hardwood flooring in the living/dining and kitchens and luxurious plush wool carpets in the bedrooms. The penthouses at Granville at 70th Cornish Estates have a particularly unique and luxurious set of appliances for their kitchen. The Granville at 70th Penthouses at Cornish Estates will feature a 24” classic wall oven, 30” stainless steel classic four burner gas cooktop, 30” wall mounted hood fan, 36” fully integrated fridge, 38 bottle under counter wine fridge and 24” stainless steel coffee maker system by ultra luxurious Miele appliances. In addition, there is a top of the line Panasonic microwave. This is in comparison to the other Granville at 70th Vancouver Cornish Estates homes and townhouses that have a more standardized set of appliances including: 24” class wall oven, 24” stainless steel classic 4 burner gas cooktop, 24” stainless steel wall mounted hood fan, 27” fully integrated fridge with 2 freezer drawers, fully integrated Optima dishwasher (low water consumption, quiet performance, overlay cabinet panel and handle pull) all by Miele. There is also a Panasonic microwave and garburator. For Cornish Estates condo, townhouse and penthouse home owners, you’ll have access to the impressive amenity spaces and services at The Granville Club. These include a full fitness gym, sauna room, outdoor yoga pavilion, indoor/outdoor entertainment lounge with outdoor kitchen and fireplace in addition to rooftop groves and gardens. The Granville Club at Granville at 70th Vancouver West Side condos also feature a putting green, library, meeting room and a theatre with mult-media screening room for all to enjoy year round. 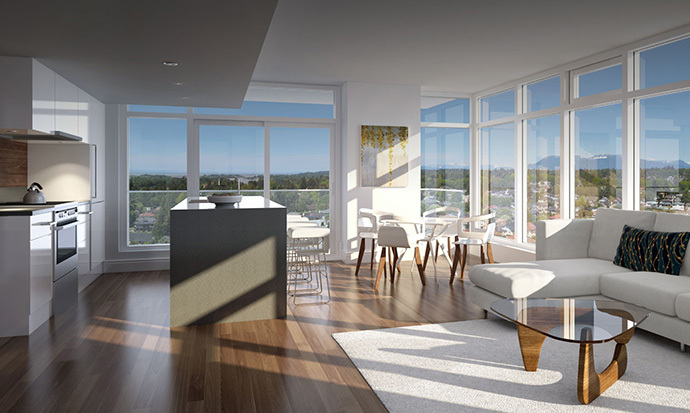 Granville at 70th, punctuates the West Side Vancouver real estate landscape with architectural prowess and elegance. Developed by Westbank; Canada’s leading luxury residential real estate development company and designed by internationally heralded architects, Henriquez Partners, this development redefines Vancouver’s West Side. There are 3 unique and highly sought after opportunities at Granville at 70th Vancouver West Side: Cornish Estates (Phase 3 and now selling), the West Tower and South Tower. Each has its unique floor plans, orientation and views and we invite you to explore them all online! Situated at Granville Street and West 70th Avenue Vancouver Marpole district, these new condominium homes will be set for completion in mid 2014 and the entire project will only launch 312 suites (condos and townhouses) for sale in all 3 phases. The floor plans at Granville at 70th Vancouver condos range in size between approximately 560 square feet to nearly 4,300 square feet! The estimated monthly strata fees are $0.40 per square foot per month and the starting price point is in the mid $400’s. 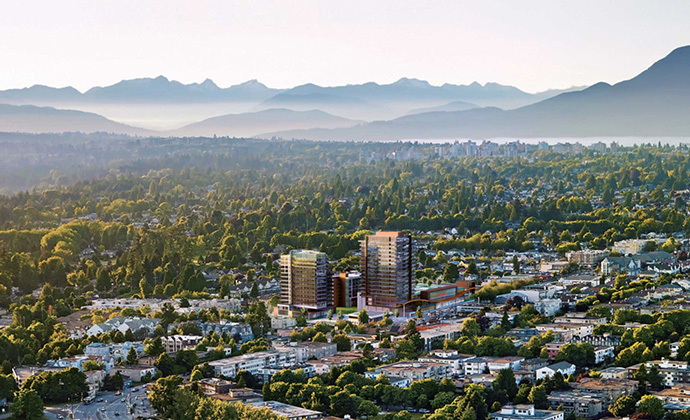 The two towers at West Side Vancouver Granville at 70th reign skyward offering spectacular views. Street-side town homes at the Cornish Estates offer a more intimate style of living, amid lush gardens and boulevards. The community of Granville at 70th Vancouver is defined by a host of vibrant features including live green-walls, rooftop groves and gardens, an outdoor yoga pavilion, indoor/outdoor entertainment lounge, a putting green, library, theatre, and “The Granville Club”, with gym facilities, steam room and sauna. Anchoring the development is a deluxe new Safeway and additional retail.